Following the stunning success of the London Olympic and Paralympic Games, England Athletics initiated Run England. The aim of this campaign was to get the nation running, and for this to be inclusive for the entire community; in so doing existing barriers to participation in sport would tumble down, whilst leaving a positive and lasting legacy from the London Games. Run England has a current membership of 48,031 participants; this is made up of mostly newcomers to both sport and running. 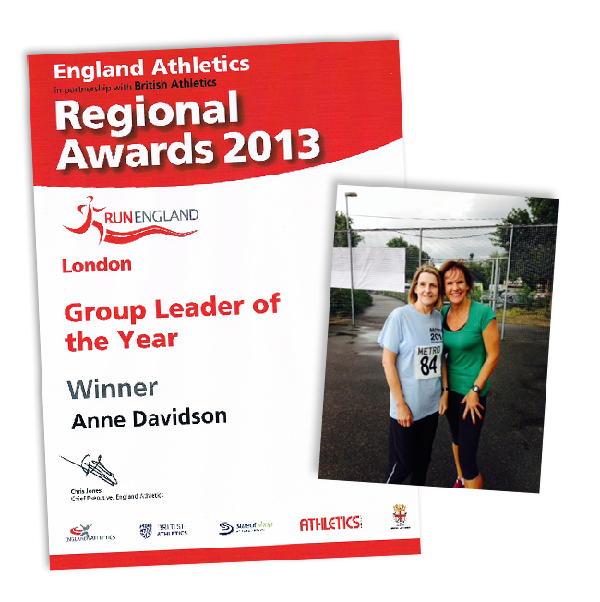 There are now 2,157 Run England groups across the country. 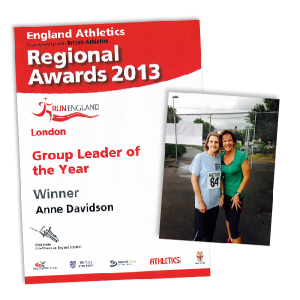 She also gained the England Athletics Volunteer Award for Sutton Blind and Visually Impaired runners – which was the winner of the Run England project of the year. If you are a blind or visually impaired runner/jogger who would like to join a group please contact me. We run weekly, short and long distances, for all age groups and abilities. Please see the Gallery for recent photos of Terry and myself at the Metro Blind Sport Games. Terry was delighted to come first in the 100m and 800m in her category. I am a certified Guide Runner, DBS Run Leader Child Adult Workforce.